Hi Fans and friends! It’s been quite awhile since I’ve made a post here. If you’ve checked you probably saw I change the weblog format and the address name. It seemed to make sense. So what’s been happening with Maine’s Fun Magician & Family Entertainer you ask?! Well let me tell you of a few adventures and new upcoming things. Where to start, that’s the problem…..Hmmmm….well I guess I’ll just share what comes to mind! Ah yes! 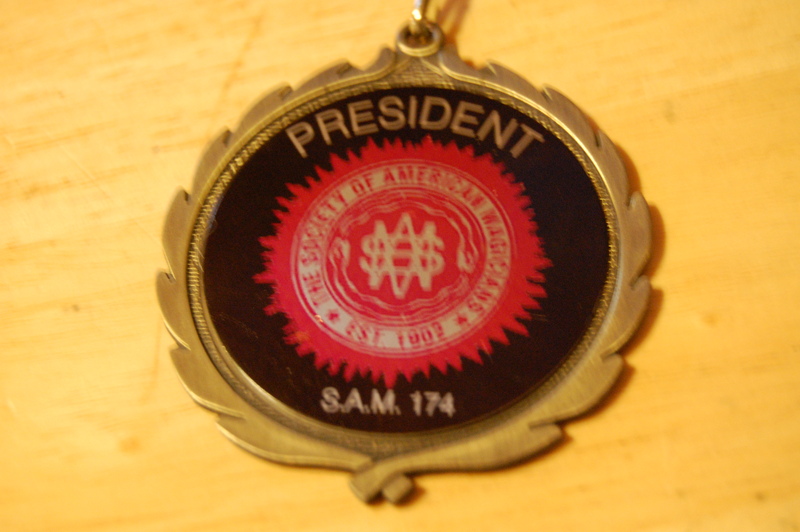 First, I have had the honor and privilege to become the new president for Maine’s Society of American Magicians! I love meeting with this group of guys and it is really great that the guys have bestowed this “Most Illustrious” title. I look forward to help bring magic to a new caliber this year in Maine! I met with many folks again during the Maine Fair Association Trade show in Portland in January. I have already booked Skowhegan State Fair again, Piscataquis Valley Fair, Harmony Free Fair, and possibly some new ones! This year I started pushing my new magic show called M-AG-icultural which is a magic show about agriculture. I didn;t have as much material ready this year as I had hope for the fair conventions, but will hopefully have everything up and running by the end of the year. My “Nutrition by Magician” program has been given a bit of new life this year working with Ben Hodgdon of 5210 Let’s Go for Somerset County. We’re hoping that I can present how I tried in the 5210 message into Nutrition by Magician to other county representatives to do extra shows throughout the state. I’m hoping that this new relationship will help me present a healthy message to schools and communities. I know that making healthier choices with more vegetables and fruits, less screen time, a bit if exercise and and removing sugary drinks is a goal that can easily be accomplished! I have officially been working on making healthier choices, since January and I have currently lost 13 pounds without even really trying! 5210 works! I’m looking forward to reporting at the end of this year how my health is by this shift in thinking and making better choices! 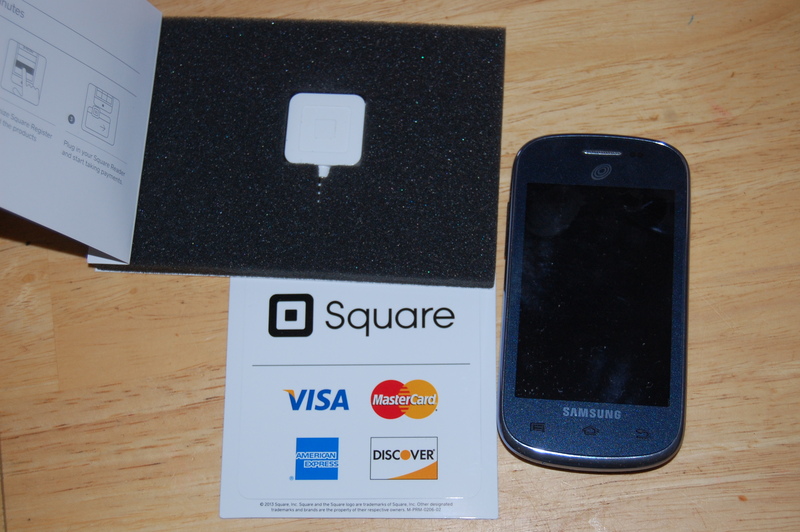 Thanks to Square up and my new smart phone (which I think may be smarter than me!) I will now be accepting credit card payments for my services. I hope that this new feature will encourage more bookings and help me be able to do more birthday magic shows in Maine and throughout New England! 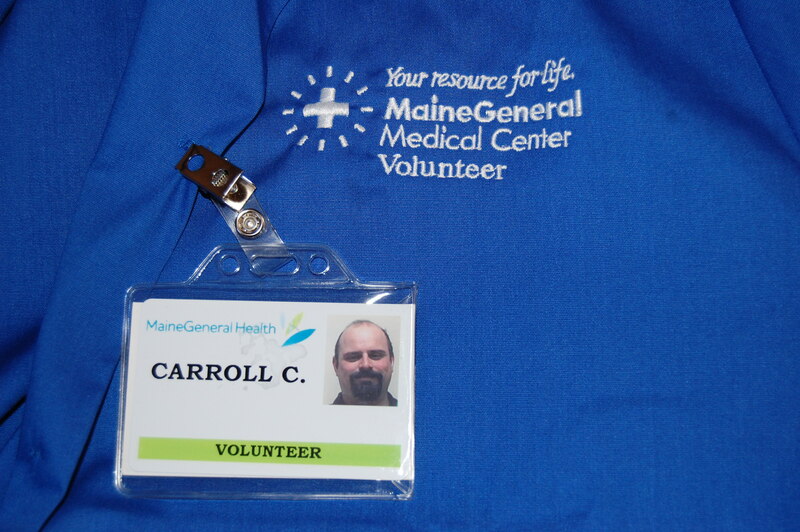 After almost 4 months or work and meetings I officially got the ok to start volunteering as a magician at Maine General. In fact, I did my first appearance the other day going from room to room in the rehab wing showing those who are healing some magic to take their minds off of all their stuff for a few moments. It was super fun and everyone was so happy for the visit. I would encourage anyone to try volunteering and see how rewarding it is. Here a picture of my blue lab coat and badge! Well that’s what comes to mind right now…I’m sure other things will pop up in my head as life goes on and I’m going to try (note I said “try” that means no guarantees!) to make a better effort to update this blog a bit more often. It’s nice to share what’s going on in my life with my friends and fans and I do hope you enjoy what I share. Also if you haven’t become a friend of my Facebook page I encourage you to become one! That is the most up to date happenings of Maine Magician Conjuring Carroll as I am frequently posting new info about shows and happenings. You can become a friend by following this link http://www.facebook.com/ConjuringCarroll I look forward to having you as a friend! Remember to find the Magic in life! Well today is Jan 1st and this is my last blog for 2009. It should have been posted yesterday but , I was busy performing my New Year’s gig. Anyways since my last post there’s been a ton of stuff going on. The biggest thing is the new addition to my family. 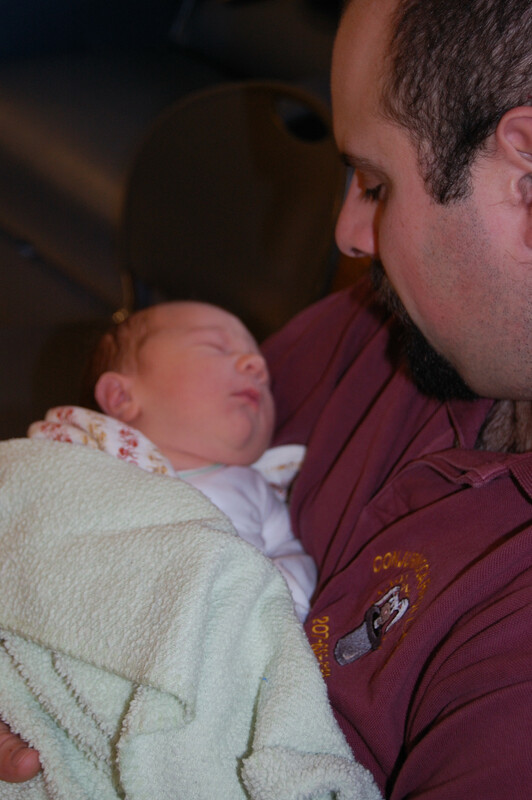 Ivan Lee-Norris Chapman was born Dec 4th at 11:35A! He weighed 8lbs. 9oz. and was 21.5″ long. He’s just as handsome as his big brother. It’s been quite awhile since I last had a little one in our house. (11 years to be exact!!!) So things have changed on how much get’s done in a day. Thus I have decided to change my weblog to quarterly as time seems to slip though my hands lately. Ok so an update on what’s been happening magically, I and several other magicians have been meeting once a month in Augusta sharing and learning from each other. It’s the best “magic meetings ” I’ve attended in Maine. October was a good month with several birthday parties and Halloween Shows. November was also a good month. Typically it’s a slow month but I was blessed with several private parties. Christmas…well thats a different story. Typically one of the busiest months was one of my slowest for the year. I was able to get a couple of shows but typically I have a lot. The reason I guess is because of the financial mess that happened earlier in the year. Companies cut back on their spending and axed a lot of Holiday parties. I understand though and was prepared for it. It was also a blessing in disguise as it gave me enough time to complete the addition on my home and prepare for our new baby. So far the outlook for 2010 is ok. I’m looking forward to speaking with many friends in the next couple of months at the fair conventions. God has been good to my family and business for 2009 and I hope that he finds favor with me in 2010. I wish you all a very happy and prosperous New Year! Until my next post…Rember to find the magic in life! Ok So I might have to start making this a quarterly weblog instead of a bi-monthly. I have had a great summer with many new and repeat shows. My last post was in May and I was talking about going to SoulJAM which was a wonderful time. My family and I got to perform some gospel magic for the patrons that day and then were given passes for the day. Ezekiel and I went on the Excalabur rollercoster. It was a blast and his first time on a big rollercoaster. we’re already looking forward to going back again next year. June was a blessed month with several end of school bookings which were mostly my nutition by magician magic show. The kids had a great time and so did I. That month I also a couple of gospel magic shows which were a blast. I got to tag team perform with one of my all time favorite band raging grace (raginggrace.com). June also kicked off my Creative Magic library show for the public libraries in Maine. I rounded out the month with Flagstaff Days which was great strolling but the show itself got rained out, we’re looking to see if we can make a make up by the end of the year, and my 13th anniversary topped the list. July was a steady month with Ezekiel at camp for a week for the first time, my wife and I were going nuts! I’m glad we’ve got another one on the way because I don’t like the quiet. Windsor days was a great time again this year and the library & campground shows kept me busy. I ended the month with Oakfield’s Rail Fan days which was a hoot. My wife is originally from Oakfield and we got to see many of her relatives. I also booked a gospel show the next day up there and there was 3 kids who asked Jesus to be their BFF! August was a great month. I invested in a new DSLR Nikon camera at the end of July and started up a new hobby of photography. It has been really fun as Ezekiel inheireted my old camera and really got into it with me. We put some pictures in the Bangor and Skowhegan Fair and Ezekiel won 2 first place ribbons at the Bangor fair and 5 firstplace and Best in Show at the Skowhegan fair. I got a couple of ribbons too but I was more excited that he got ribbons. It’s a Dad thing! 🙂 Zeik turned 11 in August and his big thing that he wanted was a “new camera” imagine that! August was also the end of the library magic show run and a couple of other community events. It was the best month for gospel magic shows as I had a show in Fryeburg, North Livermore, and Bradley Maine. All were very please with the program and 2 more kids asked Jesus into their lives. The and of the month was the start up of my fair gigs starting off with Piscataquis fair in Dover-foxcroft. The attendance was great 2 our the 3 days I was there. A hurricane had to mess up one day where it rained all day! There were a few people there that day but rain=bust when it comes to fairs. Thankfully the other 2 days were exceptionally well attended. Well again sorry for my procrastination but I’m glad I finally got a chance to tell you about my adventures this summer. I hope you summer was as blessed as mine. Until my next blog….remember to find the magic in life! Well I missed my mark by a few days! Ok at least it’s the 1st part of May so I’m not doing too bad. My goodness has there been a lot thats happened in the past couple of months. Were do I start…March was a pretty dry month for shows this year with several community events I normally did either cutting back or closing shop altogether. April was a turn around month. I had the pleasure (eventhough I was a bit under the weather) of returning to Lincoln Maine for a Expo. I saw many familar faces and a few new ones as well. I also had the opportunity to work with Old Town Parks and Recreation for their Easter Festival. It was a great day with a super turnout. April vacation was a bit weak this year but I was able to work for New Dimensions Credit Union for their National Youth Week called “The Magic of Savings”. I had a great time performing strolling magic and ballooning for their event. As I mentioned in my last post I have been leaning towards my roots in Gospel Magic and with the mentorship of my pastor have established a ministry name called Magic Outreach. Please stop by the new website I’ve designed for this ministry at www.magicoutreach.com I have already booked several churches for outreach events using magic as a means to present the Gospel. Please keep this ministry in your prayers as I endeavor to do God’s work. I had the opportunity last week to work with a church in South Portland called The Journey. It’s a foursquare church out of Scarborough. Their website is www.journey-on.org The event went very well with as many as 50+ people coming out at one point. There was a band, a magician, face painting, ballooning, and bounce houses all free and for one purpose, to share God’s love. The really BIG NEWS that has happened in the past couple of months is that my wife and I are going to be Parents again! We found out that April is pregnant and her due date is Dec 6th! We are super excited and look forward to all the joys of having a baby in the house again. Speaking of the house…I will be putting on a new addition to my house this summer since we’ve only got 2 bedrooms in our house and my son isn’t willing to share. LOL…he’s 10 I guess I can’t blame him! Well I guess thats about all I have the time to blog about for now. I do have some upcoming events the end of May at Funtown/Splashtown for SoulJAM sponsored by Worship 95.3FM It’s a christian event where there are over 20 christian bands and artists performing throughout the amusement park all day long. I’ll be at the Kids tent starting at 11:30AM. Please come on by and enjoy the festival and stop by and say hi. I’ll also be on my way to New York for the annual Hall of Famous Unknown Magicians and Clowns Convention. It’s a great time to get together with many wise magicians and clowns and we just have a good old time sharing magic and performing. It’s my once a year treat! Well until my next blog…Remember to find the Magic in Life! From the conventions I booked several fairs. Some new to me and some repeats. I also have some possible ones as well, once they get back to their committees for final decisions. February Vacation is great this year everyday has been booked! I’ll be at several libraries doing magic workshops and also some shows. Sugarloaf is in the mix as well for the Children’s Festival. I’m currently working on my Summer Reading Magic Show and looking forward to the spring. I’ve got some new trick ordered and have been working on some new routines that I hope will be well received this year in the shows. I’m gearing up for the Maine Parks and Recreation Entertainment Showcase next month as well as touching base with community festivals. I’m also working toward doing more Gospel Magic this year. Please keep this in your prayers as I endeavor to reach those who might not know the saving knowledge of Christ. Well that’s about it for now, so enjoy the weather as it gets warmer. Well it’s time for another bi-monthly blog and Christmas! One of my favorite time of year except I get a year older 4 days after Christmas. Lots has been happening since my last post. I’ve had a great run of magic during November which is kinda strange as it’s usually a slow month. Christmas shows this year were down a bit due to our current economy state, but I’m ever hopeful for next year. I have decided to take and Spend New Years this year with my family. My good friend and magic mentor Amazing Lou and his wife Loretta are also intending to celebrate with us. In my last blog I had talked about getting my doe permit and tromping through the woods. Well I got to do a lot of stomping but to no avail. I only saw one deer and wasn’t able to get a shot off. Oh well, that’s why they call it hunting and not shooting! 🙂 I got a muzzle loader in hopes I might redeem myself during the special 2 week season, but never saw another deer. I did see plenty of other wildlife though, rabbits, partridge, squirrels, birds, and even a coyote! As for magic, I’m looking forward to getting in the workshop and start refurbishing and constructing some magic. Before I can though I need to get my office in order. Between hunting and helping my cousin design menus and start his restaurant, I’ve kinda slacked on keeping it clean. (that’s the understatement of the year!) I’ve actually have a couple of new designs on some magic that I may try to market to other magician. I also have been wanting start writing a book, though I never seem to have the time. My wife joined weight watchers last fall and to date has lost 52 pounds. She looks great! I don’t even know where she had it to loose. She says she got 25 more to go. I told her I’m going to have to get some large illusion and turn her into a box jumper instead of a social worker! Well I guess that’s about it around here. I just sent out my registration for the Maine, New Hampshire, and Vermont Fair trade shows. So I get to look forward to those the end of January and first week of February. Other than that we’re doing fine and looking forward to doing some winter activities. I hope everyone has a great Christmas and a Happy New Year! Until my next blog…..Remember to find the magic in life.